As soon as I got off the phone with John, the liaison for Hunters Helping Heros in Maryland, and he told me I could invite one other person to go with us I knew exactly who to ask. It had been almost 12 years since I hunted with my dad and it seemed like families, children, deployments and life had taken over our time. This was going to be a great opportunity, not only because we are both Veterans (and it was a hunt just for Vets), but because we finally would have the chance to bond again. Ten months later Dad and I were in the truck heading to the quiet town of Crisfield, MD. It was about a four-hour drive from my parents’ house to our hotel and we couldn’t stop talking about what was to come, what was going on in our lives, our past hunts and so much more. My dad was a 22 year Navy man and most of those years were spent with his being deployed to some far-off region on a ship with limited to zero communication back home. After he retired in 2000, we tried to make up for lost time. Growing up in Virginia, the woods were just a quick drive from our house and we took advantage of that as much as we could. He pointed out poison ivy to me (which didn’t stop me from touching it many times), how to make a fire and how to load my 20-gauge single shot shotgun. Some of my most cherished memories were walking through the woods in late November, covered in camouflage and I was more concerned with the birds and squirrels running around than I was about the deer. I can only imagine what my dad thought when I spent the morning asking him things and squirming around when I should have been silently hunting deer. He never showed his annoyance and calmly answered questions and talked to me about whatever I asked. I joined the Navy after discovering college did not suit me. After 12 years of active duty, the hunts with my dad had slowed to almost none, which is why he was the first person I talked to about hunting ducks in Maryland. On the drive up, I told him all about duck hunting, the different species, the difference in wing beats and the shapes of their heads. Since I had enlisted, duck hunting had become my passion. Once I was introduced to the sport it truly took over everything I did. Some of the prettiest sunrises I have ever seen are in the marsh with the morning flight of wood ducks, teal and mallards descending over the decoys. I wanted nothing more to experience this with my dad. We pulled into our motel, dropped our bags and headed over to meet John. He showed us his boat and decoys and invited us into his home to talk about what to expect the next couple of days. Everything he said was making me more and more excited, but just as much anxiety was building over my dad because shooting ducks is nothing like shooting deer. After dinner with John, we went back to our hotel and settled in for the night. My dad wasn’t feeling well, so I packed our gear, waders, jackets, and few boxes of Remington Hypersonic shells. My final step was to pack our shotguns, and that’s when I found a familiar brown gun sleeve with the same gun lube smell that brought all the childhood memories back. I unzipped the sleeve and the worn wood grain stock with the beautiful checkering came sliding out, along with the familiar action on his old Remington 870 Wingmaster. Just the sound of the smooth action sliding home immediately took me back to the woods of Virginia. I compared the newness of my Remington Versa Max, and the V3 to his Wingmaster and was amazed at the differences. The weight was the first thing I felt; the shape, the textures between the wood stock and the camouflage wrap made them feel night and day different. I asked my dad not to take his 870 out into the salt marsh in fear of rust overtaking his 30-year-old shotgun, and after a quick debate he agreed. After more conversations about what to look for in ducks and how to lead them, we decided that 4 a.m. was going to come quick enough and went to bed. I was the first to wake up the next morning and after a quick shower I got my dad moving but he was sounding worse off than the night before. He insisted he was still able to get out on the water. I went to the only open coffee shop, got two coffees and went back to the hotel to pick him up and drive to John’s house. Kody (John’s golden retriever) greeted us. John loaded his boat and pulled it out of the garage. Dad and I loaded our few items into the boat, put on our waders, jumped in his SUV and off we went. On the water, the familiar sights and smells of a muddy salt marsh came to me just as they did every duck hunt. As we navigated with Dad on the spotlight, I turned around and John was pointing out a small stretch of water tucked between two smaller feeder creeks. We motored up and quickly set decoys in the water; mallards, black ducks, geese, and buffleheads all went in. As soon as we got the decoys wet, we pushed to our spot, threw over the anchor and put up the blind. I poured a cup of coffee and just sat back and listened to what sounded like a pair of black ducks talking back and forth. Dad and I talked as we impatiently waited for sunrise and I told him the differences in the duck noises. Inside my head I hoped they would get off their roost spots and come over to our decoys so my dad could take his first shot at waterfowl. As the dark sky turned to light pinks, I knew it was almost sunrise. I uncased my shotgun, and helped my dad get his Remington Versa Max out. We loaded up with the Remington Hypersonic shells and prepared for what was to come. Once there was enough light, I knew we might have a problem. The birds weren’t working as well as they could have. It was a picture-perfect morning, beautiful clear blue skies, zero wind, and water as flat as glass, something artists would love but a waterfowler’s enemy. Just as I was beginning to get concerned, a single bufflehead turned directly towards our spread and came in fast and hard. Once I saw the landing gear go down and him cup up perfectly I saw movement out of the corner of my eye. My dad raised his Remington Versa Max, nestled the stock to his cheek, and in the stillness of the morning, I swear I could hear the quick click of the safety and the sound of trigger firing off. We both fired at the same time and my shot went wide, a clean miss, but in the water was a beautiful stud drake bufflehead, my dad’s first ever duck. Out of excitement, I jumped right up and the hooting and hollering began. I’m sure if there were any ducks within 100 yards they knew where we were and quickly decided not to come. I jumped out of the boat with Kody to get the bird and immediately showed it off to my dad, pointing out its vibrant purple, green and white head. I shook my dad’s hand in pure excitement and we settled back in hoping for more birds. The morning turned out to be a slow one. We shot one more bufflehead and after a quick change in location, I shot my first surf scoter with the Hypersonic ammunition. As the day ended I knew my dad was feeling worse. When we left John’s house, we stopped by the pharmacy and picked up medicine in hopes of his feeling better in the morning. As luck would have it, he didn’t hunt the rest of the time we spent on the Eastern Shore of Maryland. I went out many times, getting him chicken noodle soup, Gatorade, cough drops, tissues, cough medicine, fever reducing medicine, cold and flu medicines, more cough drops, and more tissues. The next two days went by in a blur between hunting and taking care of my dad. On our last day he was feeling better, but our time had ended. Driving home, we made plans to hunt ducks next year, and he said he would like to come down to Florida to experience it. The excitement in his voice was that same excitement I must have had the first time I entered the woods with him, just a pure thirst for more fun and time in the field. Once we were near my parents’ house I felt disappointment because of the hunting time my dad missed. After nearly a decade of not hunting together, the flu had taken the opportunity from us. But as quickly as the disappointment came, I remembered my dad instilling in me, “It’s not about the kill, it’s about the hunt.” We may have had only one day hunting together on the marsh, but the conversations and time spent together, even if not in the woods, meant the world to both of us. About the Author: Russell Knaub, has been on active duty since October of 2005. His previous duty stations are HSL-44 (2006-2009), Mayport Fl, FRCMA Det Norfolk (2009-2012), Norfolk Va, HSM-46 (2012-2017), Mayport Fl, and is currently stationed at FRCSE Det Mayport, Mayport Fl. He has been deployed on the USS Underwood, USS Doyle, USS Halyburton, USS Winston S. Churchill and many other ships for smaller period of times. His father, Russ Knaub, served from 1978-2000 deploying 7 different times. They both are avid hunters, fisherman, conservationists, and proud Americas. 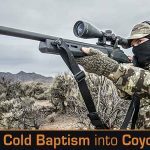 This entry was posted in Special Hunting Weapons & Tactics™ - The Center of Gravity for Tactical and Long Range Hunting and tagged Duck, Hunting, Navy, Remington, V3, Versa Max, Veterans by guestwriter. Bookmark the permalink.